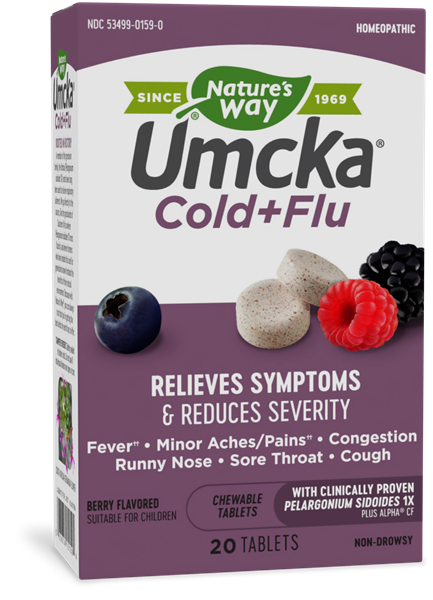 Umcka Cold+Flu Berry Chewable / 20 Chw - Nature's Way®. You can feel confident knowing that Umcka® (Pelargonium sidoides 1X) is proven effective in clinical studies for alleviating common cold symptoms, plus nasal, throat and bronchial irritations. Alpha® CF (Aconitum napellus 4X, Bryonia 4X, Eucalyptus globulus 2X, Eupatorium perfoliatum 6X, Gelsemium sempervirens 4X, Ipecacuanha 3X, and Phosphorus 6X) provides multi-symptom relief of colds and flu. A member of the geranium family, the Umcka® (Pelargonium sidoides 1X) roots have long been used to relieve respiratory ailments. We go directly to the source, like the grasslands of Southern Africa where Pelargonium sidoides 1X roots flourish, and where farmers who have tended this land for generations know firsthand the benefits of their natural environment. Because with Nature’s Way®, you can always trust that you’re getting the best herbs the earth has to offer.